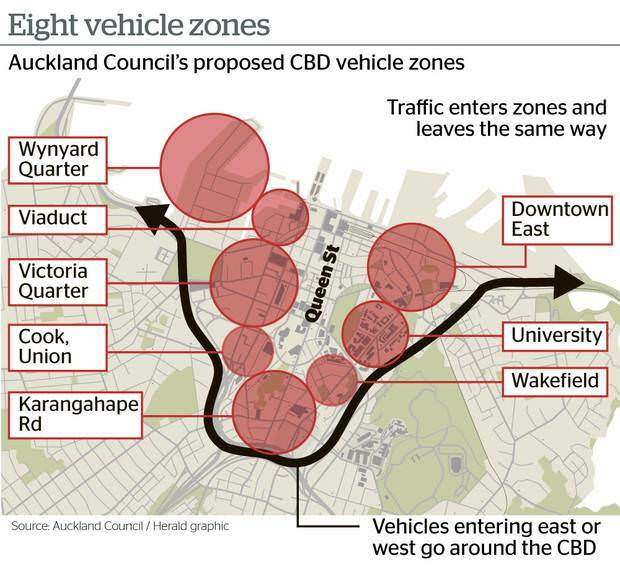 Trials will begin next year to turn central Auckland into a car-free zone. The Auckland Council voted unanimously today to adopt a strategy called Access for Everyone, which calls for all non-essential vehicles to be kept out of the inner city. As part of the strategy, the council instructed officials to come up with a plan for trials. Mayor Phil Goff says trials will start next year, based on a plan to be presented in March. The approach involves an "open streets" approach, which means opening the streets to pedestrians and other users by closing them to traffic. It will also be trialled in other urban centres around Auckland. Goff told councillors, "There are over 100,000 people working in the central city. Hotel blocks are soaring into the sky. Pedestrian numbers are doubling every few years. We have to do this. This is a lovely vision and an absolute necessity." Councillor Chris Darby noted that when the City Rail Link opens in 2024 it will double the number of people arriving in the central city by rail. Planners believe the Government's light rail proposals will add a further 10,000 people per hour in peak times. 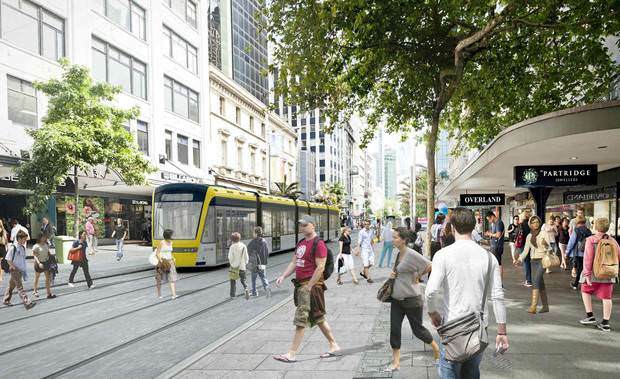 Artist impression of light rail on Queen Street central Auckland. Public Transport capacity is expected to rise by 370 per cent over next 10 years. Greater pedestrian numbers, along with growth in bicycle and scooter numbers, are already forcing a rethink in the way the central city streets are used. "There is nothing more powerful than a vision with necessity driving it," said Goff. Hulse said the change is happening already. "I want to cheer loudly about this," she said. "And before social media starts calling us car-hating councillors, when was the last time people drove on Queen St? Most people have stopped doing that." The Access for Everyone strategy came from the council's Auckland Design Office (ADO), but it did not contain a timetable and many councillors were concerned about slow progress. Closing Queen St to cars was included in the City Centre Masterplan of 2012, but nothing has happened. Ludo Campbell-Reid, manager of the ADO, told councillors that with all the construction underway right now in the central city, "there may not be much we can do downtown for a while". But Goff asked Campbell-Reid for a schedule of trials. "What have you got planned over the next 12 months for the central city and suburban areas for open street trials?" Campbell-Reid responded that it was a "big complicated issue" and there was no schedule. "But," he said, "there's a lot of things happening already. Next weekend we have the Santa Parade, when Queen St will be closed. Why not keep it closed?" He added that the agency with the authority to close streets is Auckland Transport. Darby said, "We are urging you, giving you licence to go and do things. Not just to ponder an idea." Emily Reeves of the Central City Residents Group had earlier addressed the council. She said, "As residents we wonder why it takes so long for anything to be achieved. We would just ask that you find a solution and do it quickly." Darby proposed that Campbell-Reid report back with his schedule of trials in March. In fact, this is not the first time a carless Queen St has been introduced. In the 1970s the Auckland City Council closed part of the street to traffic, but the experiment failed. Pippa Coom, chair of the Waitemata Local Board, told the meeting that back then there was "ferocious opposition", led by the New Zealand Herald, which declared that "a modern city buzzes with the sound of motorcars". Queen St now has 13 times as many pedestrians as cars. "Now," Coom said, "the city buzzes with the sound of people." Access for Everyone divides the inner city into eight "cells" around the central Queen St valley. The proposal is that vehicles will be able to enter a cell, and leave it the way they entered, but not move from one to the next. The inner city will be a "place to go to, not a place to go through". The plan specifically addresses the issue of service and delivery. In general, it's expected that service vehicles would be allowed in the central city at designated times, especially overnight and in the mornings. There would be more loading bays for them. Couriers would also be encouraged to use e-cargo bikes in the inner city, along with "delivery lockers". Similar to post office boxes, and widely used overseas, they allow couriers to deliver to secure sites, for residents and others to pick up their goods from. Councillor Cathy Casey said she was "excited, very excited", but she wanted to know what they should say to businesses who believed they would lose customers if there was no parking outside the shop? Campbell-Reid said, "There are already more people coming into the city by public transport than by car. And that will double with the CRL. Businesses will have far most customers." Several councillors worried that all the focus would be on the central city, at the expense of other centres. Darby suggested that they could start their open streets trials right across the city, with celebrations and festival activities in Otahuhu, Albany, the city centre and everywhere. Campbell-Reid said, "This is not a war on the car. People like to polarise these conversations. This is about giving people real choices." Auckland's rail investment's have changed their city centre. We need to follow their lead and start working toward an underground rail link by 2030. Tram extensions to North Adelaide, Norwood and Henley should be underway now, to form the basis/spokes for an aboveground city loop. And the state government and city council need to finally bite the bullet on Grenfell & Currie Streets and turn it into a transit mall between at least Hindmarsh and Light squares. The streetscape is truly unpleasant at present and is a disincentive for people to choose public transport over driving. ^Everything in this quote!, especially an underground loop. That'll go down well with the natives..
Could you imagine how quickly Mark Hamilton’s head would explode if this was presented to the ACC! Big infrastructure investments are usually under-valued and & over-criticized while in the planning stage. It's much easier to envision the here and now costs and inconveniences, and far more difficult to imagine fully the eventual benefits.